Gov. Mark Dayton said Monday that his proposal to balance the state's projected $6.2 billion deficit contains "terrible cuts" that will have "devastating effects" for some of the state's poorest residents. 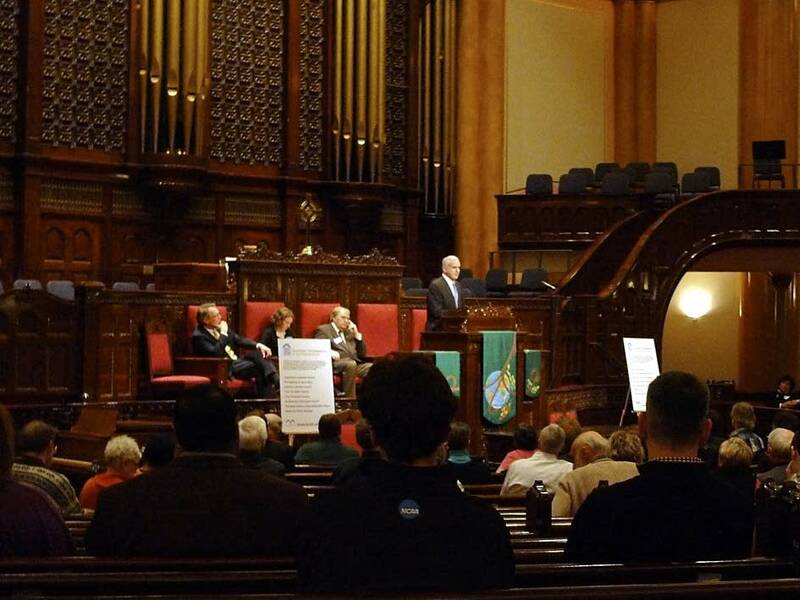 "I hate what I'm having to do," Dayton said at a Minneapolis event organized by the Downtown Congregations to End Homelessness. Hundreds of advocates for the homeless gathered at Westminster Presbyterian Church to get a glimpse at what they might expect from the Democratic governor's budget. Dayton plans to release his proposal for the state's 2012-13 budget on Feb. 15. The governor did not discuss the details of that proposal on Monday, but repeatedly said his budget cuts would be tough on poor and homeless Minnesotans. "I won't pretend here that even my budget, which is a balance between revenues and spending cuts, is not going to have drastic effects, painful effects, harmful effects," Dayton said. House Republicans voted last week to cut $1 billion in spending for health and human services, the state's colleges and universities, and aid to cities and counties. The legislation includes cuts to welfare programs for disabled and low-income Minnesotans. House Ways and Means Committee Chairwoman Mary Liz Holberg, R-Lakeville, has said the House budget proposal is based on a "basic premise most people understand: When you know you're out of money, stop spending." House Democrats opposed the bill. House and Senate Republicans have also introduced legislation to restrict the use of EBT cards -- the cards that welfare recipients use to receive food and cash assistance each month. Republicans have argued that some welfare recipients are wasting the money on alcohol and tobacco. At Monday's event, Dayton did not directly mention the pending Republican legislation, but had sharp words for those who demonize the poor. "If [the poor are] viewed as welfare cheats ... beasts who need to be strangled, whose functions of government need to be strangled, profligate spenders, wasters of society's valuable resources -- those pejorative terms dehumanize those human beings," he said. The governor urged the audience to fight deep cuts in health and human services programs. "Be at the Capitol, be at the hearings, demand hearings, insist on hearings, make sure that these budget proposals are being scrutinized and compared," he said. Last year, homeless and formerly homeless residents ramped up efforts to fight welfare cuts, even as they struggled daily with finding shelter, getting access to medical care -- and for some, coping with severe mental illness or chemical dependency. The stakes were high. Adults faced losing access to health care, while families with a disabled parent or child faced the potential loss of their monthly cash assistance. A group that included some of the most marginalized members of society turned into a rapid response team that regularly testified at the state Legislature, met with lawmakers, and organized protests. Now many of the same low-income Minnesotans are preparing to fight this year's round of budget cuts. Dayton concluded his remarks with a plea delivered from the pulpit. "Help us remember that these decisions are not only about the dollars and cents," he said. "They're about our values and our priorities. They're reflections of us. They're about our humanity. They're about the way in which we will account for ourselves someday in the future when that judgment is rendered." State Rep. Morrie Lanning, R-Moorhead, Sen. Scott Dibble, DFL-Minneapolis, and Rep. Karen Clark, DFL-Minneapolis, also spoke at the event. Lanning has introduced legislation that would provide community grants to help move people out of poverty. A 2010 report from the Wilder Foundation indicated a sharp increase in the number of homeless people in the state. The estimated number of homeless Minnesotans jumped from 3,500 people in 1991 to 13,100 people in 2009, according to that report.